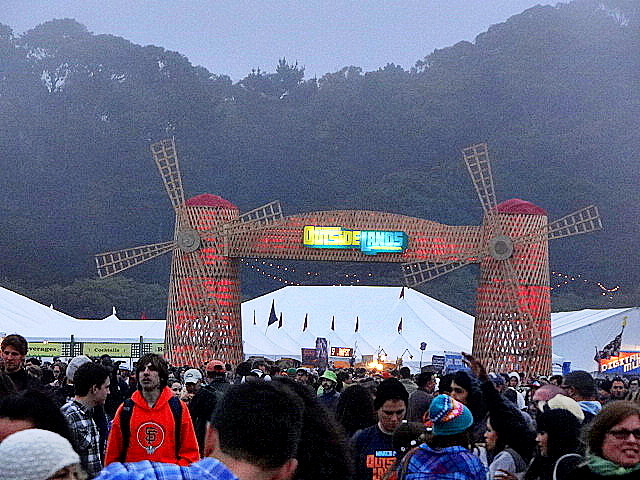 Still lots more coverage to come from Outside Lands 2012! From the first notes of FUTUREBIRDS’ “Johnny Utah” at their set down in Hellman Hollow on Friday at high noon to the Stevie Wonder-led “My Girl” singalong closer on Sunday, Outside Lands 2012 was a resounding, across-the-board success. 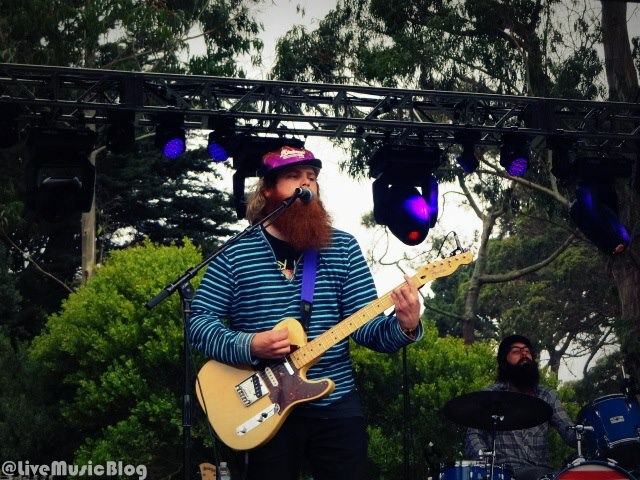 The peak-level quality of music, setting, food, drink and weather in Golden Gate Park all contributed to making this happening happening an overload of delight for all five senses. Wine Lands, Comedy Tents, Choco Lands, Beer Lands, gourmet food offerings, killer street art and some interesting folks offered enough side appeal to make all breaks from music action worth allocating time for. Being a newcomer to the fest and the city, I was initially drawn in by what was arguably the year’s most impressive and stacked festival lineups. By the time we exited the Park on Sunday night, my extremely high expectations for the weekend had been obliterated, and the bar for festival excellence raised to new heights. Throughout the weekend, festival goers were greeted by cool and comfortable Nor Cal weather, as periodic blankets of the Bay Area’s trademark fog rolled through the exceedingly idyllic woodland layout – a setup that expertly utilized the park’s natural beauty to create some rather picturesque daytime vistas and a wondrous nocturnal mystique, particularly within the well-accentuated and uber-cool Choco Lands area. The still-young event, in its fifth year, has unquestionably established itself as one of the nation’s premier music festivals and is a must-stop at some point for those who don’t mind the crowd sizes at the larger U.S. mega fests such as Jazz Fest, Coachella, Bonnaroo, etc. 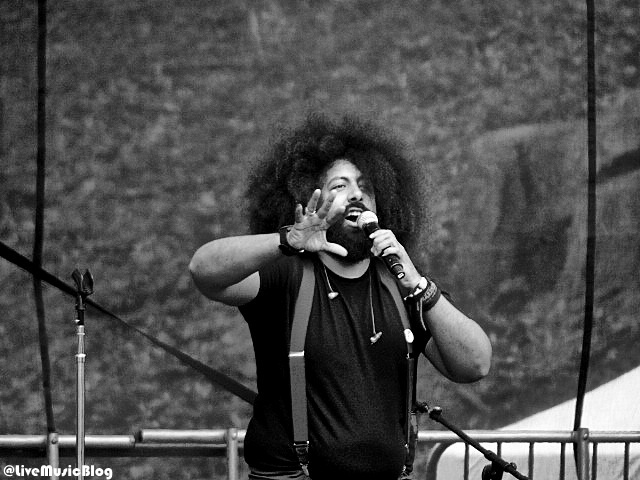 Outside Lands 2012’s unofficial orientation appropriately was in session early at the nicely valley-tucked Sutro Stage where Brooklyn-based comedian/singer/beatbox extraordinaire Reggie Watts improvised his way through a set that meshed comedy and music seamlessly, with neither element considerably more or less essential to the set’s appeal than the other. Moreover, Watts did an admirable job showcasing his pristine and soulful singing voice amidst jokes, banter and some learned loop pedal wizardry. This kind of fun, light-hearted mélange is exactly what a festival’s for and Watts read his audience like a book, delivering a bout of hilarity that got this thing moving in the right direction right from the get-go. Beck’s set was heavy on earlier offerings, replete with mellow acoustic Sea Change material (dedicating “Lost Cause” to Adam Yauch) and a whisper-versed “Where It’s At” that produced the day’s first big dance party moment at the main stage. Any other performer maintaining such a staid, aloof temperament would likely be panned for not bringing enough energy, but Hansen’s cool cat persona and wry sense of humor compliment his music well – nothing is forced and he’s a one-of-a-kind. Beck’s set came on the heels of an intimate show the previous night for the lucky few who snagged tickets to see him at Bimbo’s, a show receiving rather lukewarm reviews from our friends in attendance. 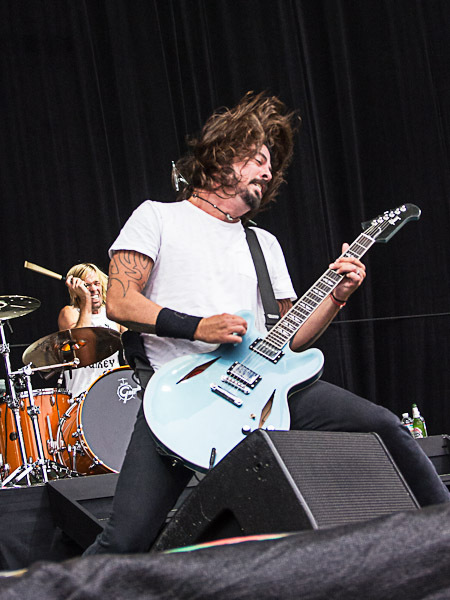 Foo Fighters, played to the largest crowd of the weekend in an oddly-placed slot before Neil Young & Crazy Horse, kicking the crowd energy into full-blown hysteria in a way that only Grohl & Co. are capable of. Looking down on the crowd from the hill above the Polo Fields was one of those awesome major festival sights to behold, watching the sea of humanity all simultaneously losing their s*** in lockstep with Hawkins’ pulverizing drum leads. On that note, drummer Taylor Hawkins perhaps needs to be cloned so future scientists can (for the good of all mankind) replicate his energy source, there just isn’t a parallel in rock music today. Can call it 40 Year Old Energy. Maybe can push it out around the time he plays Iggy Pop in the new CBGB film? Young’s set unfortunately lost a good portion of the crowd early on, focusing on intriguing protracted, feedback-heavy guitar experiments like the roughly 18+ minute mega jam opener “Love and Only Love” and other lengthy improvs for the first hour. As an aside, I loved every minute of it. After working on the same note, feedback and distortion in a way that would give Thurston Moore fuzzlust, Young & Co. dug into more engaging classics like “Cinnamon Girl” and “Powderfinger,” more familiar tunes that received the deserved attention of the then thinned-out crowd. I personally give credit and to Crazy Horse for avoiding the festival-pandering, robot fest set thing, and avoiding the temptation that gets the best of most great bands who choose to deliver more canned, radio-friendly versions of their hits. The payoffs for those standing at attention were plentiful and it was rewarding to see a band of Crazy Horse’s advanced age still innovating, pushing boundaries and breaking new ground as a live force.